Mushrooms are not a true vegetable in the sense that they do not have any leaves, roots, or seeds, and really don’t need any light to grow. So what exactly is a mushroom? It is a fungus, which grows in the dark and creates more mushrooms by releasing spores. Mushrooms are found all over the world. Ancient Egyptians considered mushrooms to be food for the royals. The French adored the fungus and began harvesting them in caves during the seventeenth century. These famous fungi didn’t reach popularity in the United States until the late 1800s. Consuming mushrooms that are not edible can lead to symptoms of sweating, cramps, diarrhea, confusion, convulsions, and potentially Result in liver damage, or even death. Selection: Mushrooms are available all year long and although there are many different varieties, selecting any kind of mushrooms is easy. They should be firm, moisture-free (not dry), have unblemished caps, and be free of mold. Storage: Place purchased loose mushrooms in a paper bag in the refrigerator. Airtight plastic bags tend to retain moisture and will accelerate spoilage. Properly stored mushrooms will last for approximately five days. 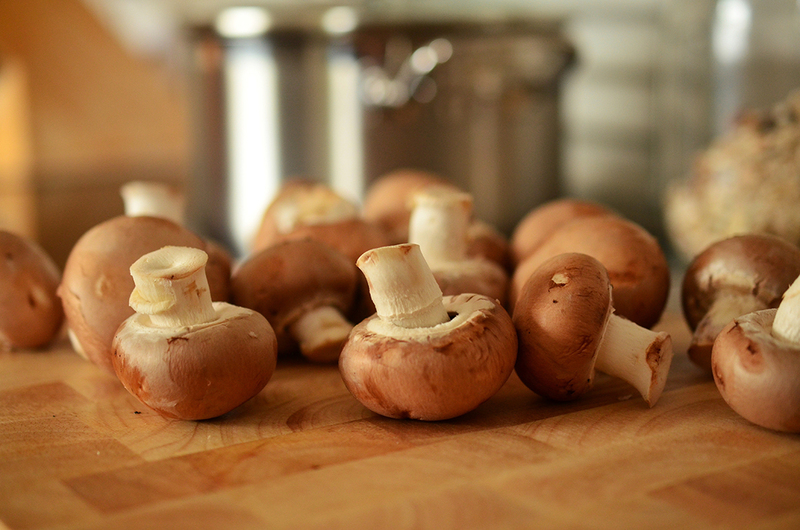 Mushrooms can be frozen but they must be cleaned, cooked, and placed in a 1/2 cup or 1 cup container before freezing. Remember to mark the date on the container, frozen mushrooms will last several months. Cleaning: Clean mushrooms only when you are ready to use them. Remove any bits of the debris on the surface, rinse with cold running water or gently wipe the mushrooms with a damp cloth, paper towel, or soft brush. Preparation: Dried mushrooms are intensely concentrated in favor and should be treated more like a seasoning than a vegetable. You’ll need to soak the dried mushrooms in hot water for 20-30 minutes, rinse, then chop, and use. Saving the soaking water and adding it to your sauces or soups will intensify the mushroom flavor. Mushrooms are versatile and may be eaten raw or cooked, whole, sliced or chopped. Certain varieties like shiitake and portobella, must have their stems discarded or used as a flavoring agent, as they are often tough. Nutrition: Mushrooms are overflowing with protein, B vitamins (riboflavin, niacin and pantothenic), and minerals (selenium, potassium, and copper). They’re low in calories and may have antibacterial substances to help the body. Cooked fresh mushrooms offer the most nutritional benefit versus the canned version that may have more sodium. Add oil to a large, deep skillet or wok and sauté onions, garlic, and mushrooms until slightly soft. Stir in red pepper flakes, ginger, Seasoning Blend, or other non-salt seasoning, peas, black beans, tomatoes, rice, and cilantro. Heat through, and place on a large serving dish. Makes 4 servings.